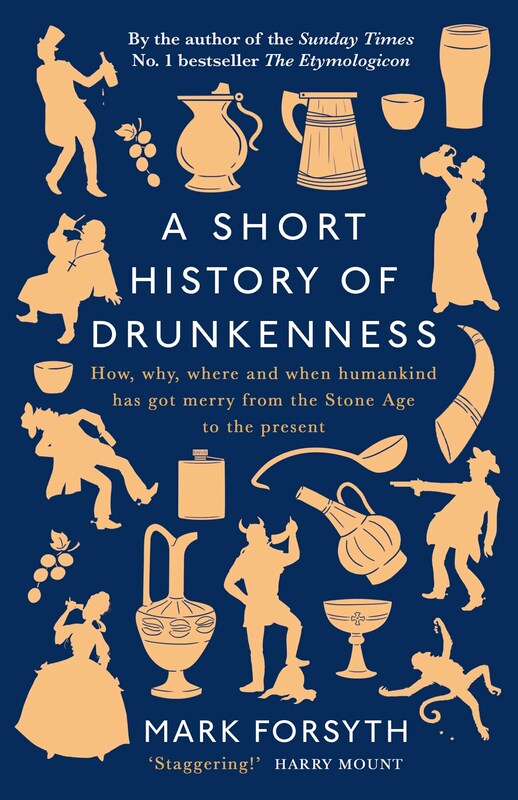 This post has already gone up twice; but, as it's the one on which I worked hardest, and as this blog is always gaining and losing adherents, I see no reason not to wheel it out for a third time. As the Bellman remarked, "What I tell you three times is true". The idea of the post is simple. When you type a phrase into Google, Google tells you how many hits that phrase gets on the Internet, or how many pages contained that exact line. It should be stated before we begin that Google is, for a computer program, often strangely illogical and inconsistent, but it's the best we've got. The number of hits is listed after the line. Click on the author's name for the full poem. 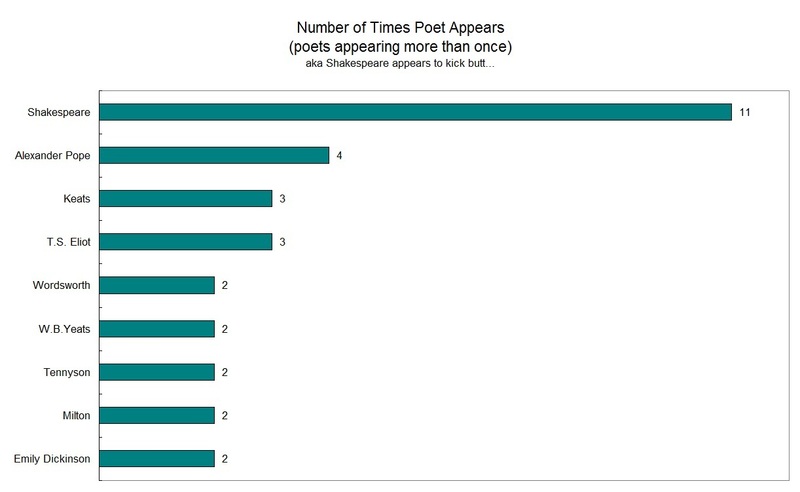 Shakespeare doesn't make the top ten and Gertrude Stein is more quoted than Byron. Bet you didn't see that coming. 4) or is pretty exclusively for children (e.g. I do not like green eggs and ham). 5) The phrases were googled in "inverted commas", which gives you only pages with the precise phrase. 6) No more than one line per medium sized poem. Originally I didn't allow tetrameters, or at least required a couplet, however "The child is father of the man" changed our minds as it's the second place on its own and nowhere when linked with the adjacent lines. These rules have been broken a few times at our discretion. P.S. 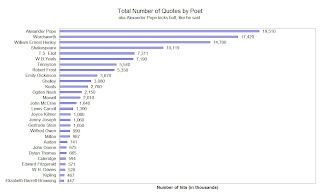 Google is sometimes eccentric on the number of hits, which can vary by clicking refresh. This is because it keeps adjusting to deal with spam and people trying to fool Google in to high rankings for their page. So sometimes it does odd things with line-breaks or even gives more results when there are more words in the search, which is utterly illogical. They also seem to vary slightly by country. Robert Frost's lines dipped slightly (or I noted them down incorrectly). The final arbiter has to be what pops up on my screen when I try the line in inverted commas. P.P.S. Because of the demands of work, I shall not be able to leap upon corrections, suggestions and amendments with my usual predatory alacrity. These were measured back in February 2010 and may have changed. My attitude to such ructions and revolutions will be, I am afraid, utterly idle. I refer complainers to the Bellman. And that's just the ones that come immediately to mind. Are you sure you've looked at a wide variety of poetry quotes? Not to mention "cry havoc and let slip the dogs of war" which gets 5,290,000. Are you sure about quote 43. The moving finger writes; and, having writ,/Moves on571,000 Edward Fitzgerald? Nor all thy Tears wash out a Word of it." Fizgerald is known as the main translator of the Rubaiyat which is where the confusion arises. The phrase "This is just to say" gives me 11,500,000 hits, and all of at least the first couple of pages are about the poem, although they're not all quotes of the poem. Unfortunately, that's such a common phrase that it's likely to occur in a lot of unrelated contexts. 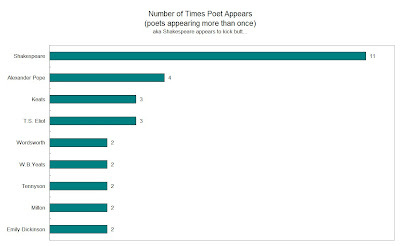 Almost none of the Shakespeare lines you are quoting are in fact poetry. Just for the record. Tazio, Edward FitzGerald translated Omar Khayyam's 'Rubaiyat' into English, and is known to have added to the original and changed it a great deal: the general rule now is to cite Fitzgerald as author in relation to his own version, since while Khayyam was his starting point, Fitzgerald remade the 'Rubaiyat' - other versions, credited to Khayyam, now exist in abundance, and don't feature the phrases that appear in Fitzgerald. Not only is Fitzgerald the most known translator of Khayyam, his translation (which is the one you quote) is as much an entire rewrite, as it is translation. He did a great deal of restructuring, and even some complete creation of some quatrains to make the arc fit his desired shape. Looks to me like the Shakespeare lines are poetry, Other Anonymous. In the plays, main characters speak in blank verse. Only the peons speak in prose. All of the quotations from plays are from major speeches. "All the world's a stage, And all the men and women merely players"
Appears to be quite popular despite the inference that we are all a bunch of luvvies. I am intrigued that "Through caverns measureless to man" gets 1,500,000 hits where "In Xanadu did Kubla Khan" currently gets 390,000. "And - which is more - you'll be a Man, my son!" 3,960,000, while the first line still only gets 843,000 despite our searches. I grow old, I grow old, I shall wear the bottoms of my trousers rolled.. (Eliot) It looks to me that it has enough hits to enter the list???? Noting Jules' comment, a moderately independent methodology would be to use Google Ngram. At least there one knows that only the exact phrase will turn up. Also one can note historical changes. Unfortunately, the complete line requirement is not directly implementable because the dataset only contains up to "5-grams". 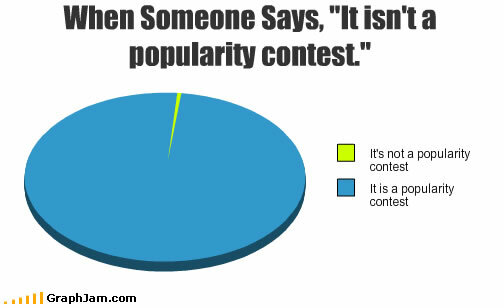 A second distinction is that the corpus contains only published books, a rather different sample, of popularity with the sort of people who write books, instead of the broad popularity that is measured by your search (as it is in principle, rather than as it is in actuality, as noted by Jules). 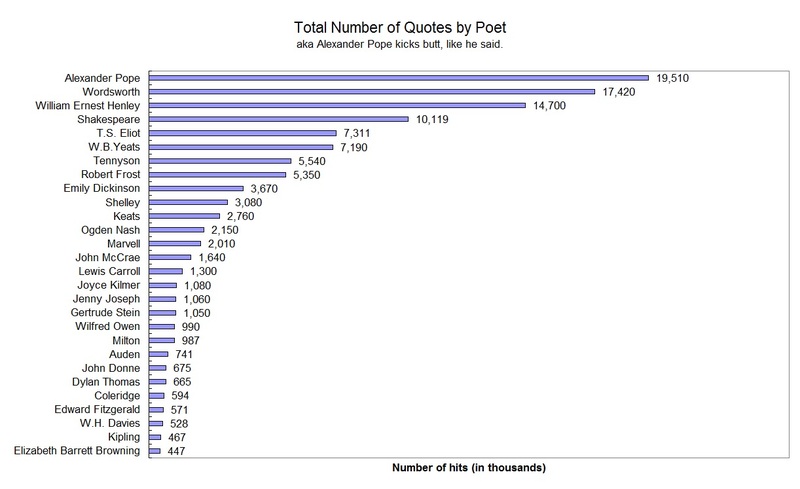 Hmmm, too bad we can't analyze what poems are quoted in common speech. How about on sitcoms? Ashes to ashes, dust to dust. 2.5 million & I bet it's actually quoted in speech more than any of the googled lines. 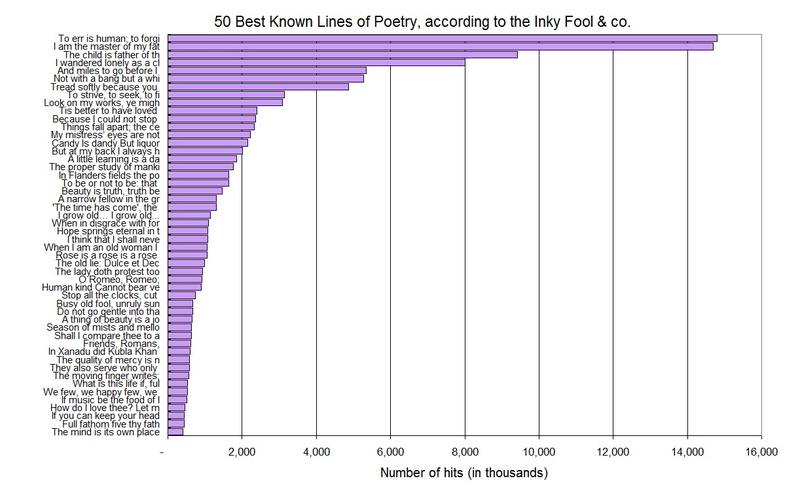 13,400,000 for "Roses are red, violets are blue" in quotes, putting it tidily in third place. 1) It has to be a poem you are aware of so that they can all be entered individually. Isn't it great that all the real poets wrote in English! "Twas brillig and the slithy toves"
"the owl and the pussycat"
Did you have a childhood? I also suspect your results are being tainted by "local" Google results (UK/USA) as I (in the UK) have put a few lines into Google and I am getting +75% approx. greater hits than your results. I'm sorry but I really feel that you need a better qualification system. 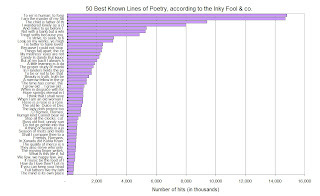 The research system is unreliable as, if you enter one line, say: "I think that I shall never see" you get 367,000,000 hits, whereas, just by adding "A poem lovely as a tree" by Alfred Joyce Kilmer, you get 16,200,000, but if you replace poem with "billboard", Ogden Nash, you'll still get 1,360,000. I haven't gone too far into the precise nature of the quotations but with the case of the first example only the first ten pages pertain to the Joyce Kilmer poem. It's an interesting exercise and, as the posts here show, very thought provoking! 1,920,000 hits. I'd say that makes the list, almost top 10. "There are greater things in heaven and earth" - 62,500,000. bam! Ah hah! Thank you, Wikipedia. "On First Looking into Chapman's Homer" by John Keats...and it's apparently the Pacific Ocean. "Water, water, every where, / And all the boards did shrink; / Water, water, every where / Nor any drop to drink."